Handicap safety can be improved with inexpensive shower products like shower mats that provide non-slip protection during your shower. Taking a bath or a shower at home is an experience many people take for granted. When adults get a little older, the act of taking a shower can be hazardous without the right safety features in place. Falling in a shower can cause devastating injuries. Especially for older adults, shower safety is a must. Installing a shower mat is a simple and affordable way to prevent shower slips and falls. 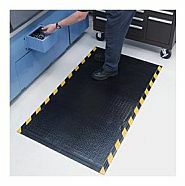 There are shower mats that can withstand the rubbing tires of a wheelchair while still providing a solid grip on the floor and for the user. Shower mats with suction provide a great deal of security. A good shower mat has multiple suction cups that adhere securely to the tub surface and prevents skidding. The shower stall mats non-slip feature helps to ensure the mat will stay in place under wet conditions. A textured surface protects further against the possibility of slipping as shampoos and other soaps accumulate during the shower. It is important to keep the shower floor and mat surface cleaned regularly to prevent soap scum from building up. Here are some best recommended mats to place inside of a shower. All these shower mats have some form of slip resistant shower mats that will provide grip and safety. Vinyl Square Shower Mats – Made of Vinyl with slip protection. Shower Stall Bath Mats – Built in holes for water drainage. 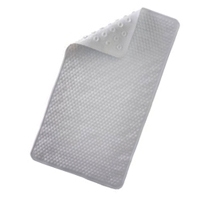 Rubbermaid Shower Mats – Inhibits mold and bacteria growth while providing grip on shower floor. Slip Free Square Shower Mats – Soft cushion surface with drain holes. These are great non slip cushioned shower mats. Rubber Bath Mats – Skid resistant and comfortable mats to place inside your bathtub. Buy handicap shower and bath mats with no-skid safety. With shower stall mats, you can get more creative with your color and size options to liven up the bathroom. The average shower mats sizes can range from 16 inches to 34 inches. Shower stall mats are also very easy to clean and machine washable. However, do not put them into the dryer as that can damage or even melt the rubber found in these mats. Some handicap floor mats are designed with holes that allow water drainage. The washing machines might miss the tiny edges of the holes, so in order to clean the mat holes, use a scrubbing brush along with some soap. A small amount of bleach mixed with water can help with disinfections. The ratio is usually 1 tablespoon for every gallon of bleach. Before placing the shower stall mat back into the proper place, wipe the area dry and clean so bacteria and mildew growth is reduced. With additional features like being anti-microbial and free from latex, shower mats are suitable for many different individuals. This mat to the left, works well in damp environments. You can place the mat near the entrance of the roll in shower area and have a dry area to step onto after a wet shower. It has been certified slip resistant by the National Floor Safety Institute. Teak shower mats have many benefits over shower rugs. With traditional shower rugs or mats, the mats can get moist or soggy after you place your wet feet in them. Teak mats wick the water better than most other substances. People use this wood for their outdoor decks or patios. The water can also drain through the holes between the teak pieces. Independent living is a possibility for many years to come when a common sense approach is taken towards safety. The smallest changes, like adding a handicap shower grab bar or shower mat in your bathroom environment, can increase your well-being drastically. Shower mats are a relatively inexpensive measure to take against accidents; they can be purchased for as little as ten dollars. With a wide range of sizes and a variety of colors available, finding a suitable mat is easy.